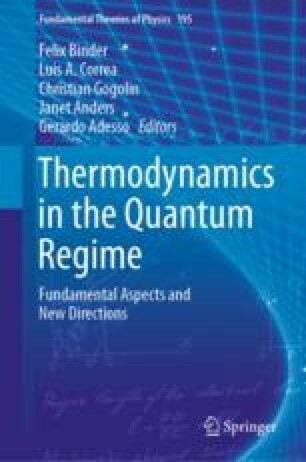 We review the use of an external auxiliary detector for measuring the full distribution of the work performed on or extracted from a quantum system during a unitary thermodynamic process. We first illustrate two paradigmatic schemes that allow one to measure the work distribution: a Ramsey technique to measure the characteristic function and a positive operator valued measure (POVM) scheme to directly measure the work probability distribution. Then, we show that these two ideas can be understood in a unified framework for assessing work fluctuations through a generic quantum detector and describe two protocols that are able to yield complementary information. This allows us also to highlight how quantum work is affected by the presence of coherences in the system’s initial state. Finally, we describe physical implementations and experimental realisations of the first two schemes. We thank R. Fazio, J. Goold, L. Mazzola, K. Modi, M. Paternostro and J. P. Paz for illuminating discussions. P.S. has received funding from the European Union FP7/2007-2013 under REA Grant Agreement No. 630925, COHEAT, and from MIUR-FIRB2013, Project Coca (Grant No. RBFR1379UX). FC and AJR acknowledge financial support from ANPCyT (PICT 2013-0621 and PICT 2014-3711), CONICET and UBACyT.